The first legal restrictions to hinder the spread of disease were enacted against human disease. Plantquarantine may be defined as the restriction imposed by duly constituted authorities on the production, movement and existence of plants or plant materials, or animals or animal products or any other article or material or normal activity of persons and is brought under regulation in order that the introduction or spread of a pest may be prevented or 8 limited or in order that the pest already introduced may be controlled or to avoid losses that would otherwise occur through the damage done by the pest or through the continuing cost of their control. When plant pathogens are introduced into an area in which they did not previously exist, they are likely to cause much more catastrophic epidemics than do the existing pathogens. Some of the worst plant disease epidemics that have occurred through out the world, for example the downy mildew of grapes in Europe and the bacterial canker of citrus, the chestnut operation of the quarantine regulations. It is extremely difficult to predict accurately whether an exotic organism will become established, and once established, become economically important. 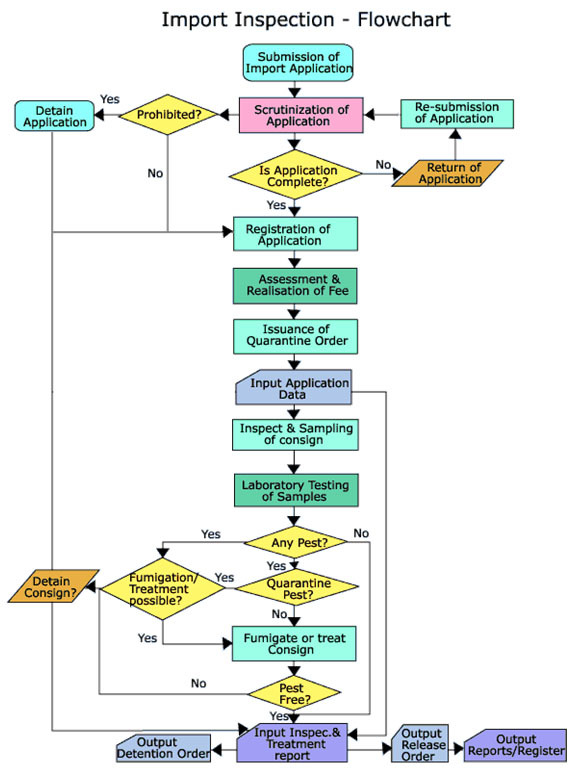 Factors which affect entry and establishment of an organism are (1) hitchhiking potential compared with natural dispersal; (2) ecological range of the pest as compared with ecological range of its host; (3) weather; (4) ease of colonization including reproductive potential, and (5) agricultural practices including pest management. The National Plant Quarantine Station at Rangpuri, New Delhi and four Regional Plant Quarantine Stations at Amritsar, Chennai, Kolkata and Mumbai are the major stations and are located at places having international airport/seaport/land frontier with neighboring countries. 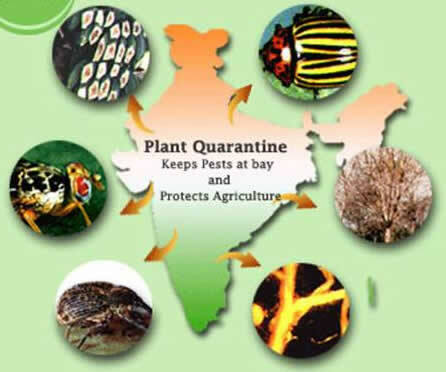 National Bureau of plant (genetic Resources, New Delhi which is the nodal institution for exchange of plant genetic resources has been empowered under PQ order to handle quarantine processing of germplasm and transgenic planting material being imported for research purposes in the country. As per the recent amendments made under the PQ order, the Advanced Centre for Plant Virology at JARI, New Delhi, Indian Institute of Horticultural Research, Bangalore and Institute of Himalayan Bioresource Technology, Palampur have been identified for ensuring virus-free status in the imported in vitromaterial. Under the DIP Act, there is a provision of Domestic Quarantine to restrict the inter-state movement of nine invasive pests viz flute scale, sanjose scale, coffee berry borer, codling moth, banana bunchy top and mosaic viruses, potato cyst nematode, potato wart and apple scab. Keeping in view the biosafety concerns associated with the growing of imported transgenic material, a containment Facility of Level -4 has been established at NBPGR, New Delhi for their quarantine processing. Plant Quarantine regulatory measures are operative through the "Destructive insects & pests Act, 1914 (Act 2 of 1914)" in the country. The purpose and intent of this Act is to prevent the introduction of any insect, fungus or other pest, which is or may be destructive to crops. The import of agricultural commodities is presently regulated through the Plant Quarantine (Regulation of Import into India) Order, 2003 issued under DIP Act, 1914 incorporating the provisions of New Policy on Seed Development, 1988. Further, the significance of Plant Quarantine has increased in view of Globalisation and liberalisation in International trade of plants and plant material in the wake of Sanitary and Phytosanitary (SPS) Agreement under WTO. The phytosanitary certification of agricultural commodities being exported is also undertaken through the scheme as per International Plant Protection Convention (IPPC), 1951. To facilitate safe global trade in agriculture by assisting the producers and exporters by providing a technically competent and reliable phytosanitary certificate system to meet the requirements of trading partners. Detection of exotic pests and diseases already introduced for containing/ controlling them by adopting domestic quarantine regulations. Undertaking Post Entry Quarantine Inspection in respect of identified planting materials. Conducting the Pest Risk Analysis (PRA) to finalise phytosanitary requirements for import of plant/plant material. There are 35 Plant quarantine Stations at different Airports, Seaports and Land frontiers implementing the Plant Quarantine regulations. The NPQS, New Delhi and RPQSs at Chennai, Kolkata, Amritsar and Mumbai have been strengthened with modern equipment for plant quarantine testing, etc., to facilitate speedy clearance of imports and exports under the FAO-UNDP Project. The Sanitary and Phytosanitary Agreement of WTO envisages application of Phytosanitary measures based on scientific justifications therefore it is imperative to conduct all Plant Quarantine inspections as per the International Standards/guidelines. Accordingly, the National Standards for Phytosanitary Measures for some of the important activities have already been developed and adopted including the Guidelines for Development of National Standards for Phytosanitary Measures and six draft National Standards are under the process of approval. The Standards which are critical for our exports have been prioritised. Further, a National Integrated Fruit Fly Surveillance Programme has also been prepared with a view to establish pest-free areas against fruit flies. To streamline the Plant Quarantine activities, efforts are being made to computerise the Plant Quarantine Stations for speedy and transparent functioning. Substantial efforts have also been made towards the international cooperation on the phytosanitary matters including participation in IPPC Standard Committee meetings for development of International Standards for Phytosanitary Measures, Training of fumigation service providers and regulators in methyl bromide fumigation under the Australian Fumigation Accreditation Scheme, finalisation of SPS Protocol for export of mango to China, harmonisation of phytosanitary measures with reference to Seed trade through the Workshops organised by Asia Pacific Seed Association (APSA), negotiations on free trade agreement with Thailand and Singapore, Memorandum of Understanding and work plan with Chile for cooperation on Phytosanitary matters and Indo-Nepal Joint trade and economic development negotiations. 31 WEST BENGAL Dr.Gautam Chatterjee Deputy Director (PP) Regional Plant Quarantine Station (RPQS), FB-Block, Sector III, (Opp: Shrabani Abasan), Salt Lake City, KOLKATA – 700 097.